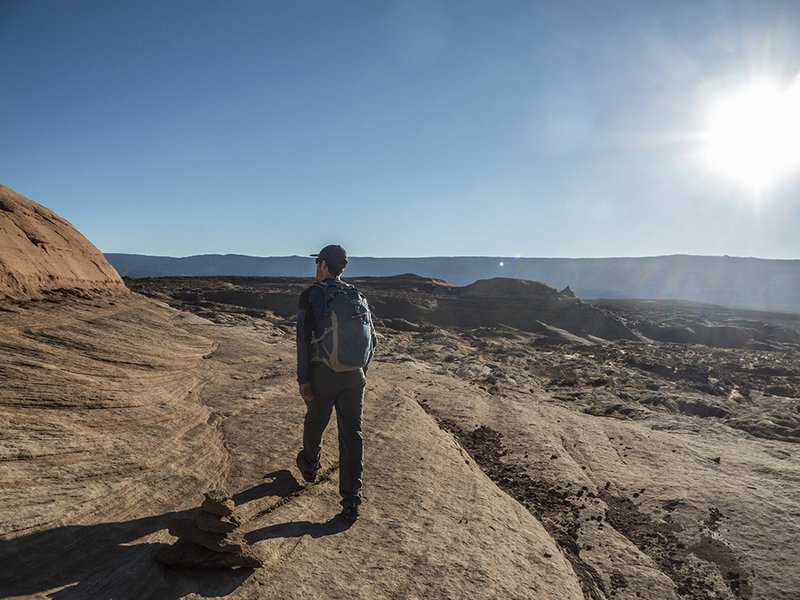 An Escalante favorite, this is a jam-packed day hike that could easily be extended into a leisurely backpacking trip. The path leaving from the trail register box starts well defined, but interspersed slickrock patches make it hard to follow. Follow the cairns, but if you lose them, head generally east over rolling domes until you hit the Escalante River, then turn north and walk along the canyon rim, paying special attention for the entrance into Crack-in-the-Wall. Cairns to the left of a thin rock fin lead you through a narrow fissure called “Crack-in-the-Wall,” a tight squeeze between the cliff wall on your left and vertical sandstone slabs on your right. You will likely need to take your pack off and slither through sideways. The route through Crack-in-the-Wall (about 2 miles northeast of where you started) drops you into the Coyote Gulch tributary. The trail winds down a steep, sandy slope. As you approach Coyote Gulch, you can see the Escalante River and Stevens Arch off to the northeast. Continue to the left of a thick rock fin, and switchback down into the bottom of Coyote Gulch. 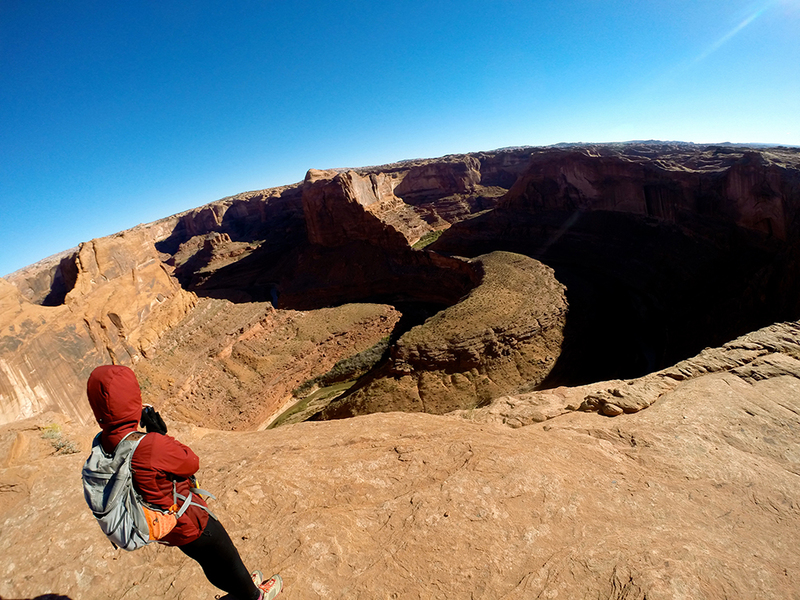 At 2.75 miles, you reach the canyon floor; turn left and head upcanyon. Cottonwood trees flash bright green against the orange sandstone walls, and willows line the creek. The trail follows the canyon floor for the next 5.25 miles, with a myriad of stream crossings along the way. Unless you are an expert rock-hopper, be prepared to get your feet wet! Hanging gardens grow along seeps in the canyon walls, while penstemons and sweet clover decorate the banks. You pass several curved amphitheater walls enroute, as well as several cascading waterfalls that can all be easily bypassed. As you round a creek meander near 4.5 miles, look low on the right canyon wall for Cliff Arch. Boulder hop past another falls, and continue through a brushy section of horsetails, willows, and grasses. Where the stream channel has eroded through a sandstone fin, the trail passes underneath Coyote Natural Bridge (6.5 miles). The next meander upstream could have once been another bridge that has since collapsed. 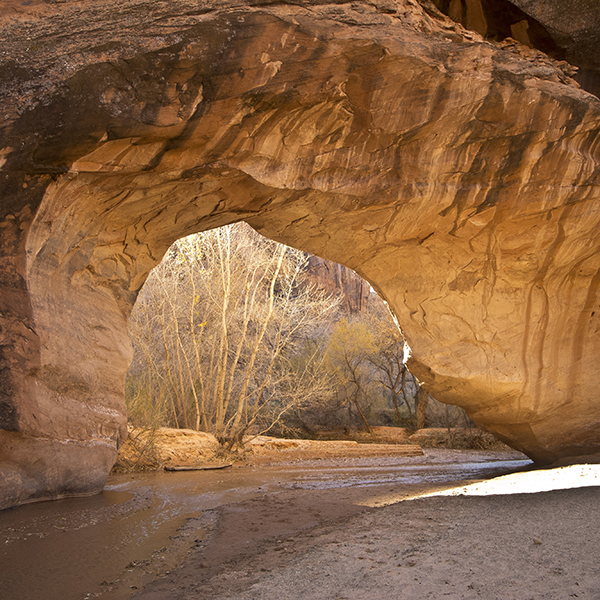 As you approach Jacob Hamblin Arch, you pass several spacious campsites shaded by cottonwood trees and a pit toilet. At 8 miles, you arrive at the arch; enjoy the rich lighting and great acoustics. 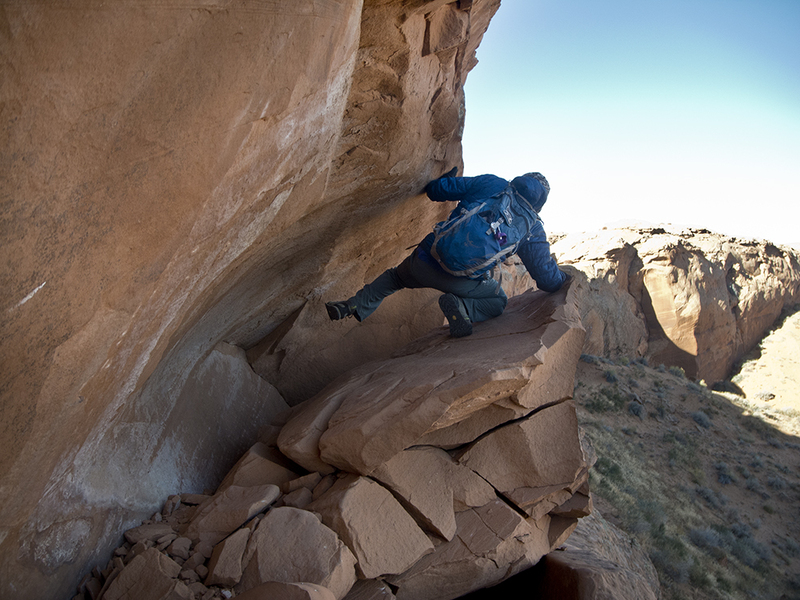 Jacob Hamblin Arch marks the exit route – backtrack to the tip of the last meander and look for a climbable crack on the south canyon wall. Work your way up the slab, looking for a few cairns that mark the route. To do this, be comfortable with exposure and steep slickrock pitches. No gear is required, but caution is a must. Small cracks and depressions allow passage up the seemingly vertical canyon wall. 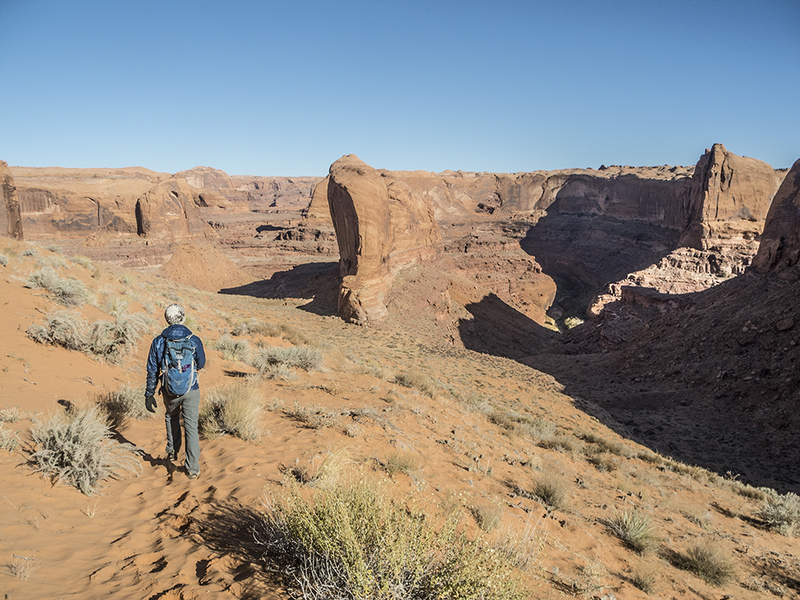 The steepest section of the ascent climbs 300 feet in a tenth of a mile, but just because you got yourself out of Coyote Gulch doesn’t mean the climbing is over. Cairns may mark a route back to the Fortymile Ridge Road (that you drove on to get to the trailhead), but be prepared to navigate two miles cross-country if necessary. The Straight Cliffs lead up to the Kaiparowits Plateau to the West; keep a southerly heading. A steep grade continues as you trek across the rugged terrain. Look for the water tanks that you passed on your drive in as a reference point, and shoot to be a little east (left) of them. When you reach the road, turn left and follow it another 2.5 miles to the trailhead. Continue heading southeast on this road for 36.25 miles. Turn left onto Fortymile Ridge Road, and follow it northeast for 6.8 miles. Stay right of the water tanks, avoiding a spur road that leads up to a parking area. Veer left at the next junction and keep heading towards the Escalante River. Drive around a cattle guard, and keep your momentum up in sandy stretches. Reach the trailhead around 43 miles. Note: Hole-in-the-Rock Road is a long, empty stretch of unpaved road, some of it across slickrock, and prone to frequent flash floods that can alter conditions. Call or visit the Escalante Interagency Visitor Center for the latest road reports before you leave; plan accordingly.